In 1994, in Manchester England, a number of people pointed out the image of His Holiness Gohar Shahi on the Moon. Then we started to receive sightings from Pakistan and other countries. Images of the Moon were recorded onto video. Then we requested photographs from overseas including NASA. In the beginning the images were not so clear, but during the last two years (1998-1999) the images have become so clear that they can be seen without the use of binoculars or a computer aid. In 1996 our representative Zafar Hussain brought this matter to the attention of NASA. NASA stated that they were aware of the face on the Moon and stated that it was the face of Jesus, which was composed of a 200 mile long light. People living in the United States requested that NASA give an explanation of these images. 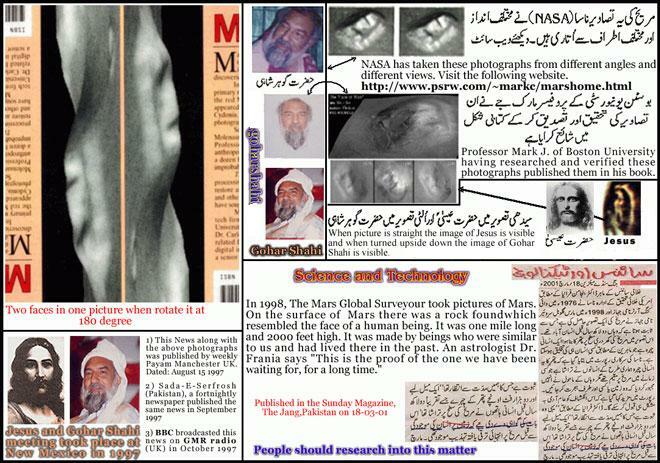 As His Holiness Gohar Shahi was of Asian origin, NASA remained silent on the matter. Instead a NASA expert Dinsmore Alter in his book ‘Pictorial Astronomy’ altered the image and presented it as an image of a woman and spread the news all over the Christian world, that the image on the Moon was that of the Lady Mary. After this news was published in Pakistani newspapers many people investigated it and then affirmed it. Many without investigation laughed at it and many regarded it as magic. Some time later there was noise about an image in Space, but its importance was not seen except amongst the followers of His Holiness Gohar Shahi. 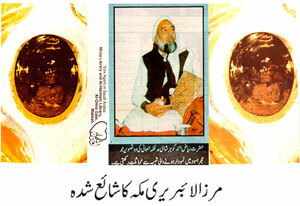 In 1998 the ‘Parcham’ newspaper published an article stating that a face had appeared on the Black Stone in Mecca. We were already aware of this image. Furthermore we had many photographs of the Black Stone showing the face and nearly all the devotees had investigated this matter. Our silence was because of the potential backlash amongst the Muslim community. We were encouraged after the publication of this newspaper article after which press releases were vigorously produced and released. Nearly every Muslim investigated this matter, as it was a question relating to the Muslim faith. Many agreed, as the image was so clear that it was difficult to deny it. Thereafter many people widely dismissed it as magic. The images on the Moon and the Black Stone were published in nearly all countries. Saudi Arabia and her allies were very disturbed, as if His Holiness Gohar Shahi had placed the image on the Black Stone himself. They say that an image is unlawful (in Islam) and how can it appear on the Black Stone. Without thinking that: How can any sign from God be unlawful? Saudi Arabia obtained judgements from its Shariah Courts declaring that Gohar Shahi be given the death penalty. Further if Gohar Shahi should step foot in Mecca he should be killed. Sects supporting Saudi Arabia in Pakistan have been trying very hard to eradicate Gohar Shahi and his teachings. False cases, including the blasphemy cases under section 295 have been instigated. 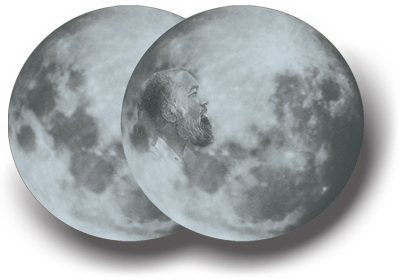 Further many attempts have been made on the life of Gohar Shahi. We have explained the background to these cases to the Government of Pakistan and requested, on many occasions that it investigate the matter of the images. 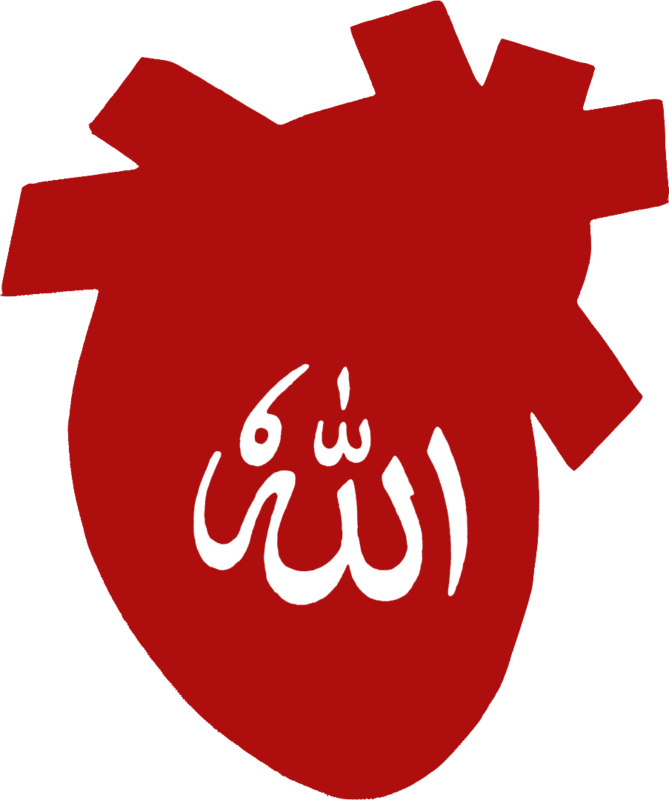 But these signs of God were dismissed due to sectarian pressure. Furthermore the Nawaz regime put pressure on the provincial authorities of Sindh to frame, quieten, or even to destroy Gohar Shahi by any means whatsoever. Now we are trying to contact the military regime and request that they have this matter investigated honestly and that these signs of God not be dismissed because of any fear or pressure. These signs of God are not to cause discord and division but are to prevent such. The proof of this is that the teachings of His Holiness Gohar Shahi are of peace and the Love of God. As a result of which all religious communities have received guidance. Further, today, Hindu, Muslim, Sikh and Christians are gathering together on the same platform, due to their belief in His Holiness and for the first time in history it has been seen that any Muslim is invited to Churches, Mandirs and Gurdwaras and is invited to speak from their pulpits. Such a personality should be encouraged, who is a reason for pride for the nation and who is appointed by God and whose truthfulness God is showing through his signs. Further through his spiritual glance peoples hearts are meditating the name of God and becoming Godly. Instead enemies of the Saints and the descendants of the Prophet (p.b.u.h); scholars and groups are active against such. Baseless cases, baseless propaganda and baseless methods are being used to turn the attention of the masses away from the Black Stone when this is a very sensitive and important matter, as it puts the faith of Muslims in danger. So why are they silent in the matter of its investigation? Such has been the negative and positive propaganda over this affair all over the world, that it is difficult to cover this matter up. Hence, so called scholars who believe in Saints but due to their enmity and jealousy they too have become speechless. As the image has become so apparent, denying it has become difficult; so they say that some magic has afflicted the Moon. Whereas the Prophet (p.b.u.h) has stated that the Moon cannot be subjected to magic. They then say that the Black Stone too has become the subject of magic. If the Holy Ka’aba has become the subject of magic, then what place do the Muslims have left for refuge? They give the example that magic was done against the Prophet (p.b.u.h); the Ka’aba is not greater than the Prophet (p.b.u.h). Without doubt magic was done on the Prophet (p.b.u.h) but the verse ‘AlNaas’ was revealed to break it. You (the scholars) may use ‘AlNaas’ and blow on the Moon and Black Stone and if these images do not disappear but rather glow even more then you will have to accept the truth. Otherwise you have Abu Jahil (falsehood) inside you.